Mix together the Honey Ginger white balsamic, brown sugar, minced garlic, sea salt, and sesame oil. Coat the ribs with the marinade and allow to marinate in a sealed container or large zip lock bags for a minimum of 12 hours or overnight, turning a few times. Combine the Honey Ginger white balsamic, honey, and soy sauce in a small sauce pan over medium heat. Allow to reduce by half and remove from heat. Add one teaspoon of Sesame Oil to the mixture and stir to combine. Prepare the grill and preheat the oven to 275. Over medium heat grill the ribs for approximately 5 minutes per side. 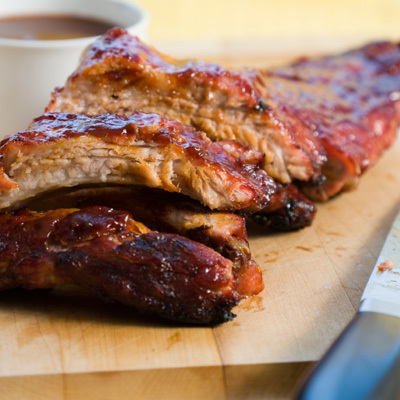 Prepare baking pans large enough to hold the ribs in a single layer. Brush the glaze over the ribs and seal each pan well with foil. Bake the ribs for 2 hours or until tender and meat falls off the bone. Optionally, sprinkle ribs with sesame seeds as a garnish.